We have really hard water where we live, and it often leaves our clothes and towels feeling a little stiff and scratchy. I haven’t used traditional store-bought fabric softener for years because we are a house full of people with sensitive skin. The solution? 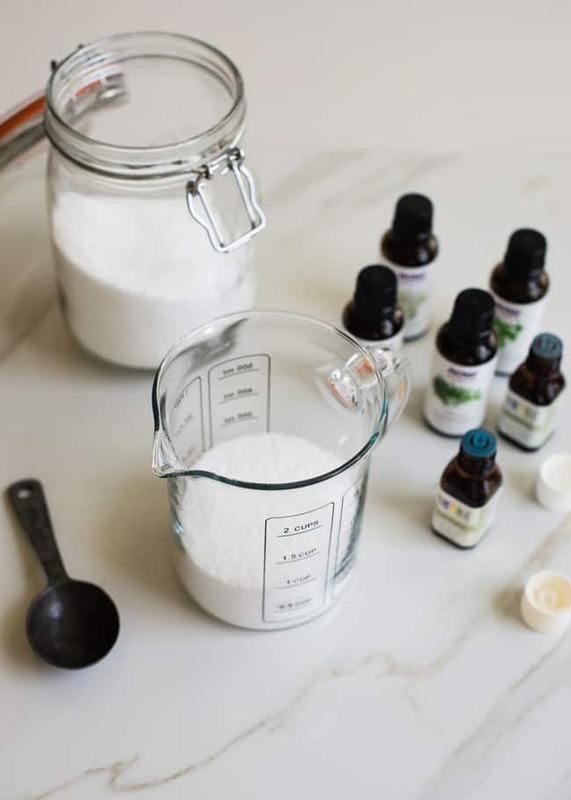 Easy, all-natural DIY fabric softener crystals made from only two ingredients! I’ve seen a lot of recipes that call for epsom salt. But I read that if you have hard water, the epsom salt will add more minerals and make it even harder. The solution? Basic, everyday salt! It’s what people put in their water softeners, right? So that’s what we’re using here. 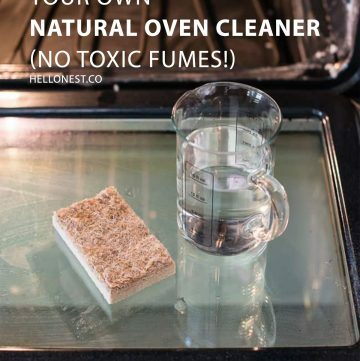 I’ve also seen softener recipes that combine baking soda and vinegar. But when you mix baking soda and vinegar together, you basically end up with club soda after the fizzing subsides. So, salt it is! 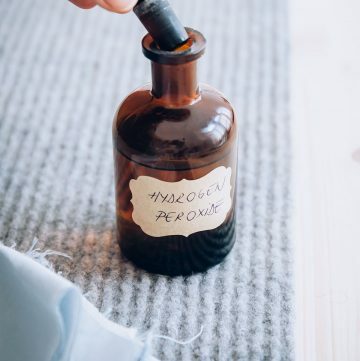 To make your clothes smell nice, add essential oils. I typically add jasmine, bergamot or lavender to each laundry load depending on my mood. 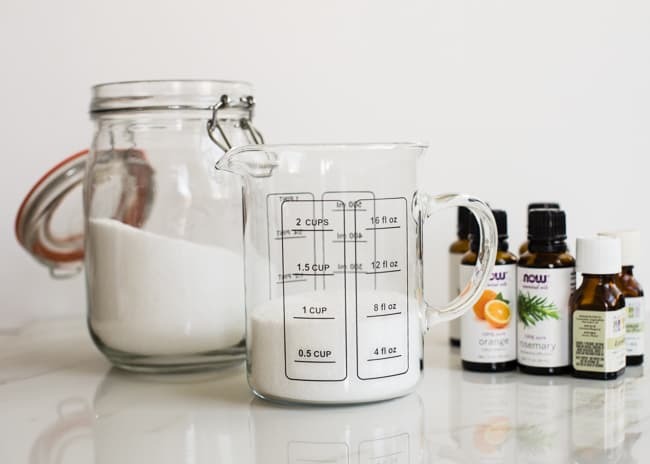 But mixing up a batch of fabric softener crystals ahead of time eliminates that small step. How much do you need? It depends on the size of the load you’re washing. A really big load might need 1/4 to 1/2 cup for really hard water, or as little as 1-2 tablespoons for a small load. More or less won’t damage the clothes, so you can experiment to see which amount works best for your water. And the best part? Everything smells oh-so-nice when it comes out of the dryer! Mix well and store in a jar. Add a few tablespoons for small loads and 4-8 Tablespoons for large loads. Is this safe to use Front loading washers? I think so! Great question. I don’t see why not. Does this get added in the rinse cycle of the wash? If not, when and where? I just add it in with my detergent because I never remember to add it during the rinse cycle. You can add it to the rinse cycle, or put it inside a fabric softener ball. Thanks! I’m going to give this a try, although my dog, who loves to roll on those dryer softener sheets, is going to be very disappointed! I would never guess. I always thought that salt would damage the clothes. I’m so going to make this, TODAY. Perfect for summer and so natural. Thank you!!! Yeah, you left out of the instructions about how and where you do this. Do you put it in the same time/place as detergent? Or one of those extra trays they have for additives? Do you put it in at the beginning or during the cycle? I put it in at the same time as the detergent. I have a very basic top loading washer. I add the detergent and softener as the washer is filling up, then add my clothes. Any remaining salt is washed away during the final rinse. I haven’t added it during the rinse cycle. I’ve read that other people do, but I don’t. Hope that helps! I can’t specify for sure about front loading washers because I haven’t used one before. The salt will dilute in water producing Cl– that will destroy the stainless steel parts of it, called pitting corrosion, I wouldn’t recommend it. Hi Petros. Thank you for your comment. Many of the commercially sold laundry detergents and softeners also contain NaCl. I’m not that worried about the salt being too corrosive especially when I add it in with my laundry detergent. But I appreciate the comment and the warning. It’s important for everyone to be informed about the risks. With all due respect, you are doing your readers a bit of a disservice here. Salt is not added to your water in a water softener, it’s used to “recharge” resin pellets that actually do the softening. The salt and water being softened do not come into actual contact, per se. That being said, as @Petros mentioned above, the salt is very harmful to stainless steel and aluminum surfaces. You are just asking for expensive washing machine repair bills in the future, ESPECIALLY if you use a front loader where there is much less water used and the salt concentration will be much higher. Thanks for the comment, Steve. I appreciate you calling me out about that. Actually, there is some sodium left in the water after it is filtered through the softener. No, it’s not much, but there is still some there. And yes, the concentration would be much higher in a front loader. http://www.merleswater.com/blog/bid/144148/Drinking-Softened-Water-How-Much-Sodium-in-Softened-Water And yes, salt can be corrosive. The salt will be washed away during the final rinse, however. And as with anything I post about, no one is MAKING you or anyone else use this in your washer. It’s up to the discretion of the reader if they want to try it out or stick with a traditional softener. But is important to be well-informed, so do appreciate you adding this into the conversation. O have hard water and habe been using ice cream salt ad my fabric softener in every load and it works great. Also, I help keep my washer in good working order by cleaning the screens on the hoses and using iron out in a cycle or with my whites. After reading the comments here about salt being a corrosive, I would definitely talk to your appliance repair man. Salt on the roads do pit out and rust our cars. Although they are not rinsed off after each use like a washing machine. People who use salt to make chlorine for their pool have the same sort of conversations about how safe it is with a metal pool. Depending who you are talking to, you get a different answer. I am all for trying it, but first I might call someone. Those fabric softeners smell so good, but are very expensive. I would love this alternative. You did mention baking soda and you are right about the vinegar being fizzy and maybe smelly. I wonder if mixing the baking soda and essential oils would work. 🙂 I think I will try that. It might cost just a little more, but still way less expensive. You can buy the soda in bulk at the pool supply. I want that smell that you get with those expensive crystals. Some are made just for the fragrance and don’t even soften your clothes. Thank you for this idea. Your point is well taken, and since I’m reading this to save money, adding a repair or replacement bill will do just the opposite. I really appreciate your comment. I have read about putting grapefruit peel (with NO fruit.. Causes mold) into vinegar to cut the smell and intensify its grease cutting abilities. I use just plain white vinegar in my laundry, and have not had a smell. I use very little. And sometimes, I use baking soda and vinegar. Yes, it does fuzz, however it also cleans well. I don’t add baking soda until the washer is full with water and clothes. And use it in place of oxi-clean on denim and pillows. I still love bleach, and was just experimenting.. Liked the results so much I bought a jug of vinegar just for the laundry room. *oxi-clean is an awesome cleaner, however I have found that if I use it on every load, every time my clothes don’t last very long. Oxi-clean is horrible to use on carpet! It will deteriorate the backing from the fibers. I also love laundry! I love the smell, full closets, clean sheets and blankets, and perhaps most of all I take a lot of pride in having clothes for a long time that look new. I have always used less detergent than recommened because I have been afforded the opportunity to be a stay at home mom, so I watch the washer fill, and add clothes one at a time.. Add detergent until there is a small sud. My grandmother only uses Amway, while that’s great.. I have had better luck with Maleluca. It takes very little, and veing a tea tree product it is naturally anti-bacterial. GREAT products! Thanks for the money saving idea’s here! I look forward to experimenting and finding what works best for my home. I love downy, just not the price. I stock up when its on sale, however.. If I can find an alternative.. I would be very happy. P.S. Thanks for the tip of using Dr. Borners soap when making laundry detergent.. I love Dr. Borners, only have liquid, but will buy he bar just because.. You are right.. I can get tea tree, rose, baby, almond.. And it will add the scent for me while being one of the best cleaners I’ve ever used. Awesome tip! So, out of this whole conversation I was not clear whether this was to be tossed in the washer on the wash cycle, or on the rinse cycle…which, I would like to try? The following is what we have used for about 2 years now. We have tried just the vinagar and that seems to work well just no scent. Instead of putting it in the washer. I have a container that is air tight and have cut sponges us in 1/2 and soak them then wring them out and toss them in the dryer with the clothes. And then reuse them. Just as good as dryer sheets. Mix all ingredients together. You can use a pitcher to mix them all together and then just pour it into an empty container. It takes a minute of stirring, but do it until no more conditioner clumps. Don’t shake it. Use 1/4 cup per load and it works great! I have a front-loading washing machine and extremely hard water. I have used the following for years with good results. 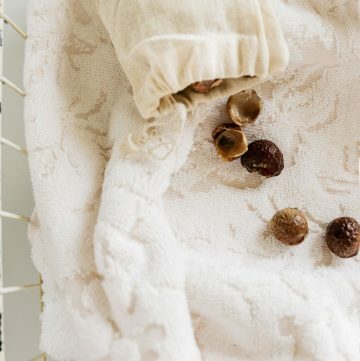 Instead of fabric softener, use plain white vinegar in more or less the same amount. If there is any faint vinegar odor, it will dissipate by the time the clothes are dry. 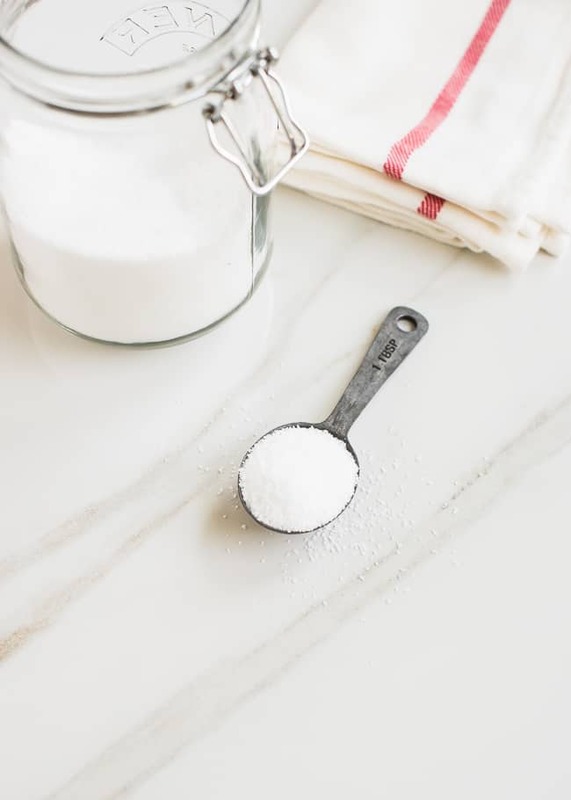 For laundry with odor issues, mix about 1/2 to 3/4 cup baking soda in some water to dissolve it and then pour into the detergent receptacle along with the laundry soap. No problem with reaction because the baking soda is in the wash and the vinegar is in the rinse cycle. 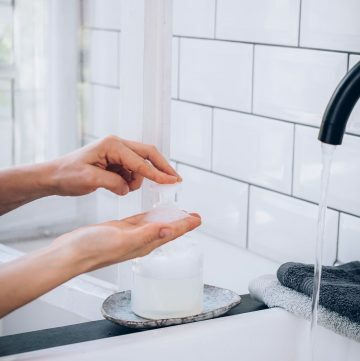 To remove extreme grease (abused kitchen towels) or old detergent residue (once or twice a year), pour 1/2 cup pure non-sudsy ammonia into 2 or 3 cups of water (prevents fumes) and then use instead of detergent. I used to use ammonia without diluting it first, but it discolored the soap receptacle of my washing machine. If there is soap residue in your laundry, an ammonia wash will appear just as sudsy as if you had used detergent. I learned this about 25 years ago from an elderly gentleman who learned from his mother, so it probably dates back to early 1900’s. I was pleasantly surprised the last time I did an annual wash with ammonia to see no suds. I’m not sure if because of the vinegar rinse or the Ecos laundry soap I’ve been using. 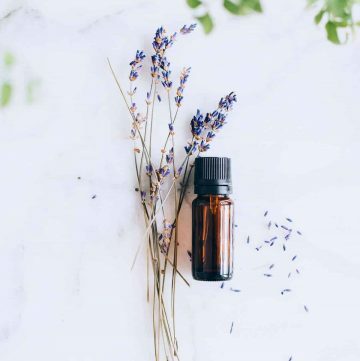 We like unscented products, so have not experimented with adding essential oils. I am concerned as well with the salt in a front loader for the same reasons. I recently had to spend a small fortune for new washer and dryer and do not want to void any warranty. I have been using wool balls that I purchased from an Amish store. They recommended using at least 3 balls in your dryer. They also sell the lavender sachets which smelled great at last for 10 – 12 loads, loved them both. I currently started adding a couple drops of the essential oil to the lavender ball and it too works great. I’ll be staying away from this one but the rest of your recipes’ have been working well for me! Would this salt softener work to keep line-dried clothes from becoming stiff? Great recipe! I’m going to try it! With your permission, I’ll link. Can you put this is the fabric softer compartment of a front load HE washer or do you have to stop the cycle on rinse and put it inside?